September | 2015 | Does This Font Make Me Look Fat? One of the families that lives in what I call the “long driveway houses” in our area celebrates holidays with putting up a sculpture, a scene, something evocative of the season. 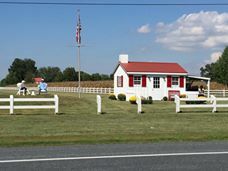 These can be seen from Rt 33 as one drives to Easton or toward St. Michaels. One year at Thanksgiving the turkey was wielding the hatchet and the farmer’s wife seemed to be at risk, one Christmas Santa’s sleigh complete with reindeer had collided with an antique airplane. 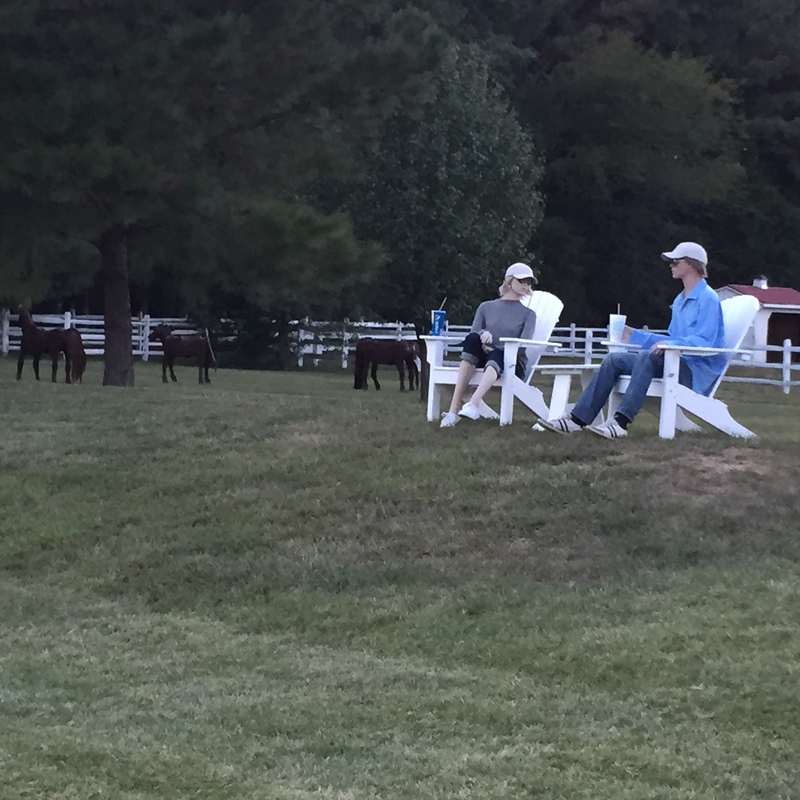 The community has grown accustomed to seeing a scene which tells a story. This year, however, this family has outdone itself. The story has been unfolding for at least six weeks. The first scene along MD Route 33 toward St. Michaels showed a guy sitting on a fence, reading a book. We actually thought it was a guy reading a book the first time we went by, but when we came back from town, he was still there so we knew something was happening. Of course, we didn’t know more was to come, so I didn’t stop and take photo. 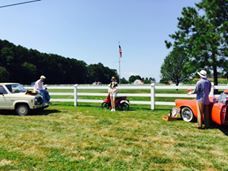 Then the fence guy’s beige pick-up joined the scene and a young woman on a red scooter. A few days later an antique red roadster joined them and it looked like they were having fun. It was heading toward Labor Day so it seemed appropriate that they were grilling. I thought that was the end of the story, so I didn’t slow down to take a picture. We saw the young woman on the scooter join the pick-up truck guy on the hood of his truck. The roadster was gone. Was romance in the air? Then a scene in which pickup truck guy is holding something out to her. A cell phone. Hell no, it’s a ring box. 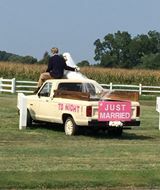 A few days later we see the couple sitting on the hood of the pick-up, the gal now in a wedding dress. 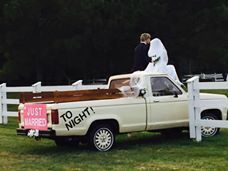 The sign on the truck says, “Just Married.” Of course that was the end of the story and I still hadn’t slowed down to take a picture. But it wasn’t. 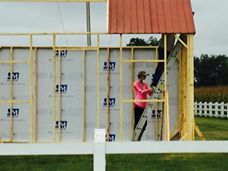 A few days later we see the young couple putting up the framing of a small house. 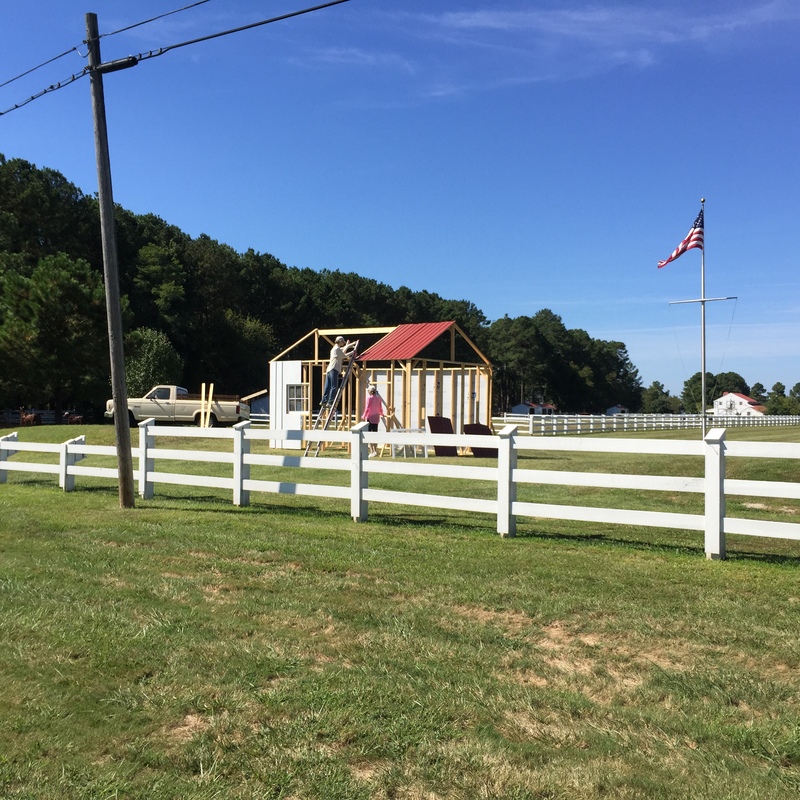 Then a piece of roof was added. Tuesday I finally stopped to take a picture. You can see the guy on the ladder and his wife nearby. I’m so annoyed with myself that I didn’t start recording this story from the beginning. A story without words. For a writer, that’s a novel idea. It’s the story teller in me that is filling in the blanks and bringing this story to life. What I imagine will be different from every other person who drives by. The wife always wears pink. My backstory knows why. 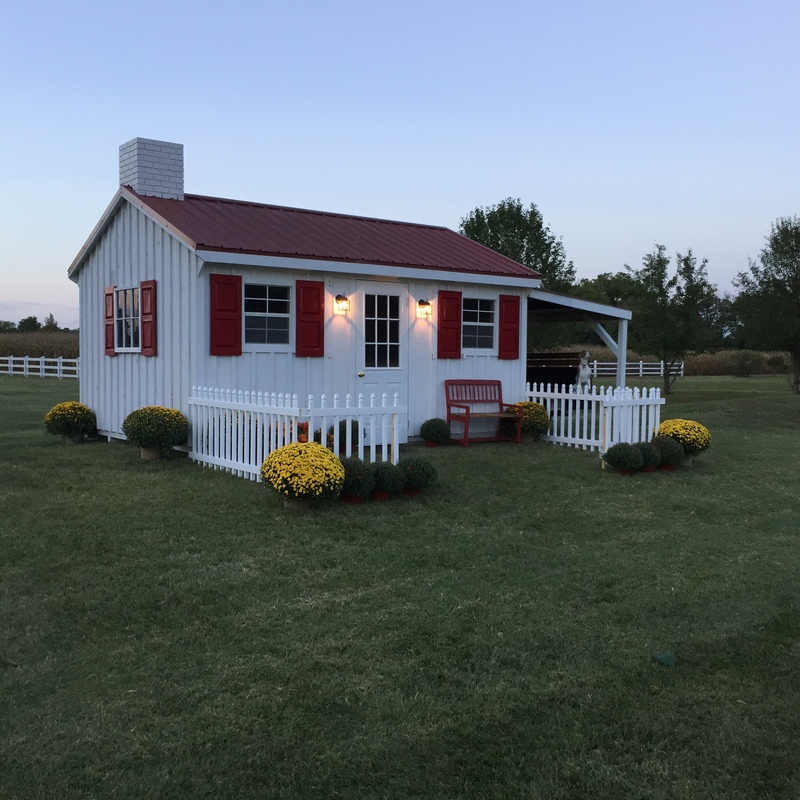 Today on my way home from Easton the little house is complete from the outside. My husband thinks we’ll see a baby carriage next. I’ll keep you posted if there’s more to the story. In the meantime, I’m grateful to this generous homeowner for reminding me that writing is not the only way to tell a story. He’s going to have to come up with something spectacular to top this story without words. 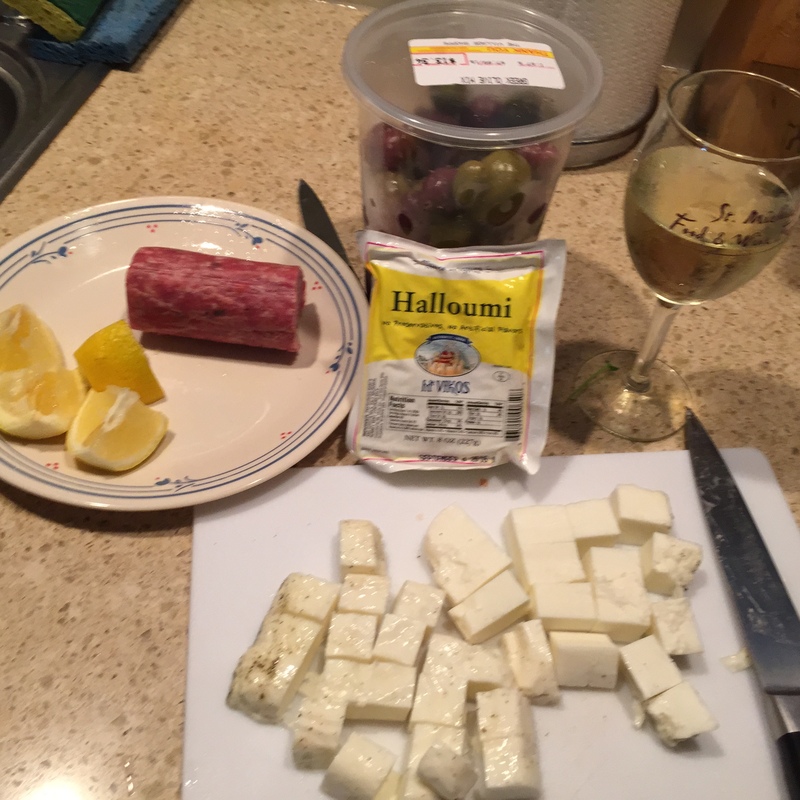 My husband loves what he calls “French dinners.” It’s really tapas from leftovers. A little bit of this and a little bit of that with a nice bottle of wine. Now I have something new to serve which elevates leftovers to another level. Fried Halloumi cheese. I saw this cheese in the health food store a couple of weeks ago. It said it was the “authentic grilling cheese of Cyprus.” It was made from goat and sheep milk which are dairy sources I can eat, so I bought some. When I came home I looked it up on the internet. Turns out that fried Halloumi cheese and olives are a staple breakfast dish in the middle east. The cheese is cut into cubes and fried in olive oil to which a few red pepper flakes have been added. The cheese gets a lovely brown crust. Laura was coming over for dinner since her husband was flying. She helped put our French/Middle Eastern/Spanish tapas dinner on the coffee table. Steamed shrimp with fresh herbs. Salami. A salad made from three different kinds of cherry tomatoes from my garden with pea shoots (local farmer’s market) dressed with olive oil and white balsamic vinegar with honey. Green grapes and local figs. And, of course, the fried Halloumi Cheese with olives. And wine. What a treat. 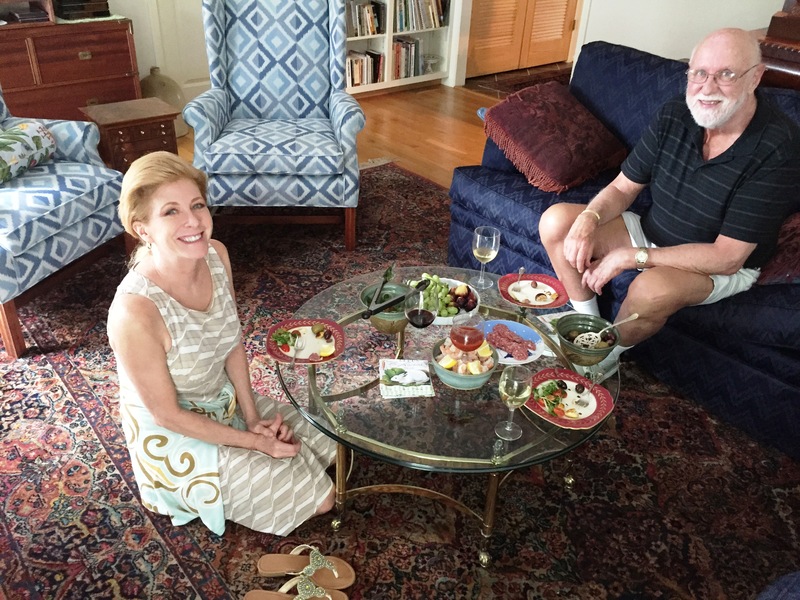 Note: unless we are eating in the dining room, Laura prefers to sit on the floor. When the evening was over I thought how easy this dinner had been. Of course with Laura I never angst about whether the house is clean, but I was talking to myself about getting better about inviting people for simple dinners that don’t take all day. The all day affairs always leave my wondering what was I thinking when I issued those invitations. I predict more French dinners in my future. My mother died six years ago. But I still talk to her – usually in that thin space between consciousness and sleep. Last week I had something troubling me and I knew it would almost certainly keep me awake. Or if I woke up in the middle of the night, I’d start obsessing which, as you know, doesn’t help solve anything. So I asked my mother what I should do. And the answer came loud and clear. What the hell did that mean? But I did go to sleep. When I woke in the middle of the night she was still telling me to bake pies. In the morning I asked my psychologist husband what he thought it meant. A wise man, he said he thought my mother was telling me to stop worrying (easier said than done) and do something that gave me joy. 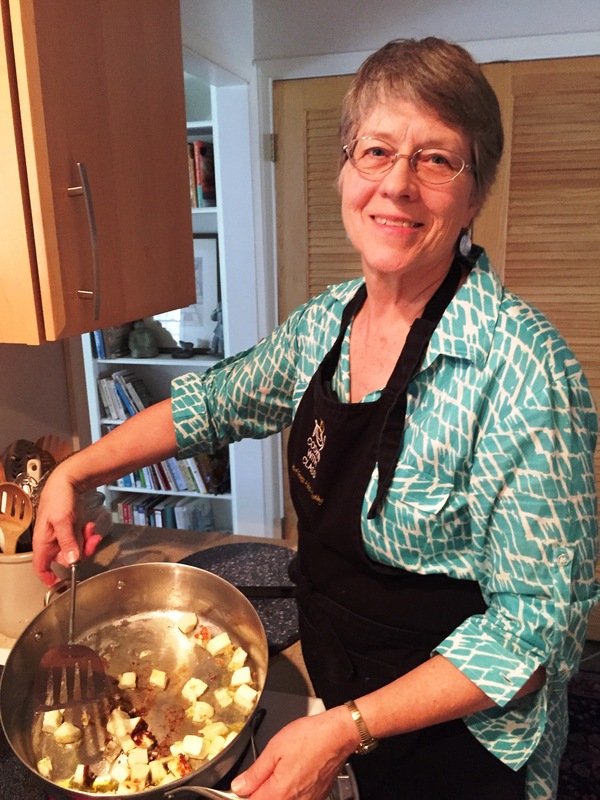 My mother was an Iowa farm girl and from her I learned to cook, bake and preserve food. We weren’t a mother and daughter who shared confidences. I didn’t consider her my best friend, but she was always there when I needed her. And she taught me confidence and how to do things. She told me I could do or be anything I wanted. At age eight, when I told her I wanted to be a brain surgeon and a ballerina, she didn’t crack a smile. When I asked for advice, she gave it, but didn’t interfere if I didn’t follow her suggestions. This time I thought I should listen. So I baked pies the next day. I haven’t baked a peach pie in a very long time, even though they were my favorite kind when I was a kid. I even made the crust from scratch. 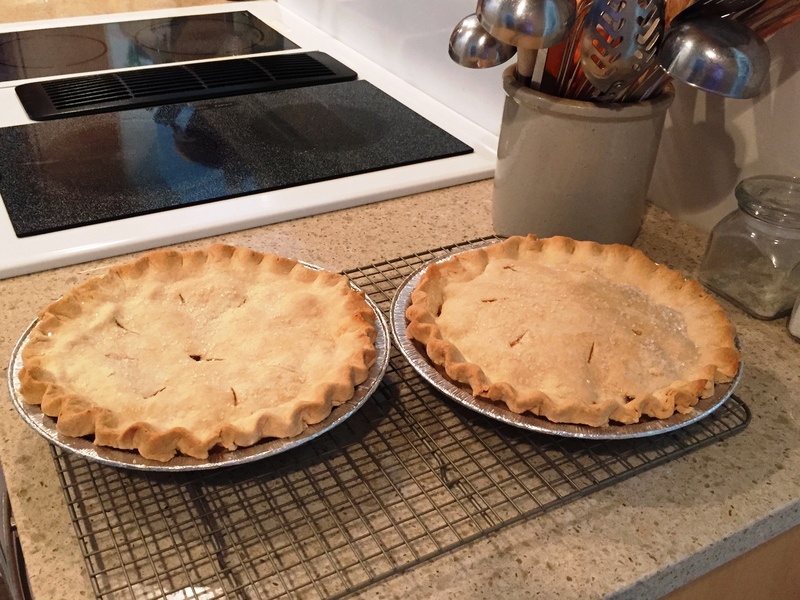 When they came out of the oven, I took one to Laura’s office and she and her accountant, Betty Ann, and I took a pie break. 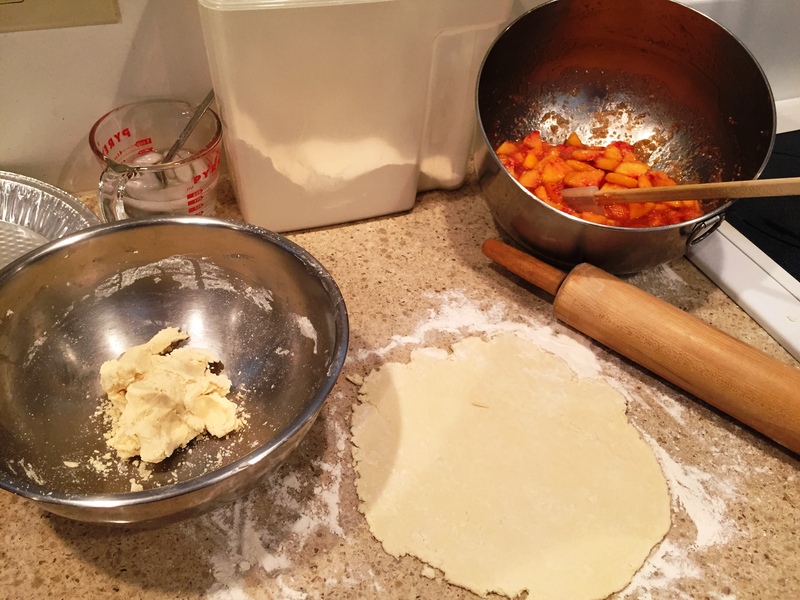 Baking pies and sharing them with friends gave me joy. Sometimes you just need to do what your mother tells you. Mindie Burgoyne is the new President of the Eastern Shore Writers Association. Both Laura and I are very involved and we are thrilled to have Mindie at the helm. This writers’ group is thirty years old this year and in the past year, under the stewardship of Jerry Sweeney, has grown. However, it is time to take stock and make sure the association’s projects reflect the member’s wishes. Most writers are introverts who work alone. I’m lucky that most of my writing is done with Laura, but people who write with a partner are few and far between. They need the community of a writers organization to keep them informed and motivated. 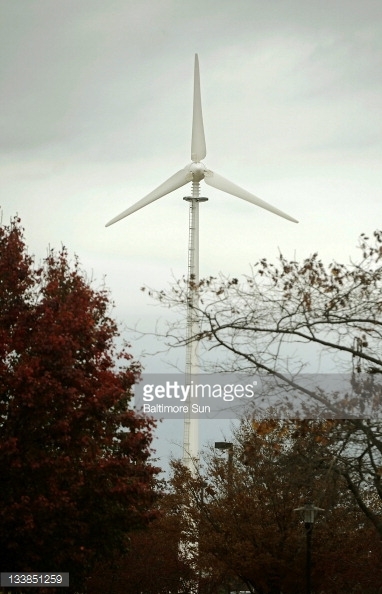 On Saturday, at Chesapeake College in a new building by the wind turbine, Mindie held a Visioning meeting which was open to the membership. About twenty-five people attended. That’s not bad for a group that is geographically spread throughout Maryland, Virginia and Delaware. In fact, that was one of the things we discussed. How can we serve members who are far away from where most events are held? We came up with some ideas to explore. Mindie had created a survey on Survey Monkey to ask questions of the membership. Eighty people responded out of about 250 members. That’s a decent sample which gave us an idea of what’s important to members. Clearly the new ESWA board will need to focus and some projects may be eliminated. That ongoing evaluation is an important part of growth and change in any organization. Both Laura and I are on the new board and we were excited and energized by the visioning process. Our first board meeting is tomorrow night. I’m looking forward to it.